Yesterday during yoga I felt that I had lost a little bit of strength/fitness in the last few weeks. This isn't too surprising as due to entertaining visitors the last 2 weeks in a row and my focus now being on doing long cycle rides with lots of vertical metres, I am not training so frequently. A weekly endurance cycle ride is great training, but not the same as before when I was running 3 to 4 times per week on top of the usual yoga and Pilates. I decided I would up the intensity of my Wednesday lunchtime run, which normally is a fairly easy jog. On the way to work I stopped at Migros in the train station and bought 5 bags of sugar. Why you may ask. Well a bag of sugar weighs 1kg so now you can maybe see where I am heading. I loaded up my rucksack with the 5 bags of sugar and when I went for my lunchtime run I strapped on my rucksack. Yes you guessed it, my new thing is running with weights. This a subject over which there is much debate about whether it is good for you or not. The fact is that if you are going to run a race with no rucksack then there isn't really any point training with one, as you are putting more pressure on your joints and changing the way we naturally run. However, if you are like me, and are training to run an endurance race where you will be carrying a rucksack, then the simple fact is that you need to start getting used to it. 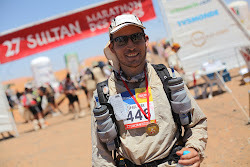 The average weight of competitor's rucksacks in the Marathon des Sables is somewhere around 10kg apparently, with the lead runners having packs that are closer to 5kg and the back of the pack runners have packs that are closer to 14kg. My theory is that if I can get used to running easily with a 5kg rucksack on my back, then I will cope much better when it comes to the race. If you never run with a pack and then try to run with one that is close to 10kg in the race itself, that is too much of a step up in my opinion. At the same time I don't want to train with a 10kg pack now, as that is too much of a jump from nothing to 10kg, and on top of that it is a lot of extra pressure on my joints and I would be more likely to get injured. If the 5kg becomes really easy then maybe I will increase it later. But for now I will try to run once a week with a 5kg pack on my back and see how that goes. Some people may say that already from nothing to 5kg is too much of a jump. I have a few responses to that. The first is that since Christmas I have lost over 5kg and I was running back at Christmas already, so my body has already experienced running at that total weight before. The only difference is the distribution of that weight - more now being on my back compared to being on my belly. The second is that I was running cross country over fields and on gravel tracks, so I didn't have to contend with the jarring forces of running on roads. And the third is that I was only running for 40 minutes or so, which is not that far really for someone that has recently completed a marathon. So you may ask how did it go. Well I was wearing my heart monitor during the run and my heart rate seemed be somewhere around 140bpm, higher than normal but still not that high. The pack felt quite comfortable on my back and didn't make any marks on my shoulders. The only discomfort was that the bags of sugar were moving around and I had to adjust them a little from time to time to keep an equal weight distribution on both sides of my body. My breathing was a little harder than usual, but still okay, and the only other thing despite the pace being slower than normal that I noticed, was that my thighs were burning slightly more. All in all though I was pleasantly surprised at how comfortable it felt. The Garmin GPS data for the data freaks out there can be found here http://connect.garmin.com/activity/86489927.